Since I work in a library and love London, I was excited to see this intriguing paperback on the "new books" shelf at my local library. 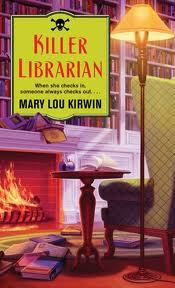 Killer Librarian by Mary Lou Kirwin looked to be right up my alley. It's the story of a midwestern librarian who fulfills a lifelong dream of travelling to London, but of course, nothing goes smoothly and there are some unexpected dead bodies along the way. Unfortunately, things get off to a bad start right away for our intrepid librarian, Karen Nash. She had booked the trip to London with her boyfriend of several years, the less-than-thrilling plumber Dave. As a list-making librarian (hmm, this is starting to sound familiar . . .) Karen had planned out what they would do during the vacation and even booked some tickets ahead of time. While waiting by the door with her packed suitcases for Dave to pick her up and take her to the airport, she receives an unexpected phone call. It's Dave saying their relationship is not working out and he's breaking up with her. Stunned, Karen has the option of calling off the trip, or going on her own. Since the tickets are booked and she's already packed, she decides to go alone. Imagine her shock, when, having been upgraded to first class, she sees none other than Dave board the airplane with a trashy-looking young blond in tow. She hunkers down so he won't see her. After arriving in London, Karen checks in at the B&B she had researched online and booked. It is small and run by a charming Englishman, Caldwell Perkins. She is delighted to see that the B&B is loaded with books, with each room having a good selection. There are a few other guests in also staying, most of them there to attend the Chelsea Flower Show. Depressed after her recent relationship troubles and having sampled a little too much British ale, Karen pours our her heart to a mysterious stranger at the pub. She confides in him about the awful Dave, his trampy new girlfriend, and how she thinks she might kill him. She also helpfully fills him in on where the disgusting lovebirds are staying. Later, she finds out that the stranger has somewhat unsavory connections and might just possibly be on the way to carry out her dark wishes. Once she sobers up, she is horrified and decides she must warn Dave. I must confess I never really understood that part. It doesn't seem to me that you should go around confessing to having taken out a hit on someone, accidental or not! Anyway, aside from that pesky problem, Karen soon discovers one of her fellow guests dead at the B&B, and even though the police seem to think the death is natural or accidental, Karen is suspicious. She is also becoming increasingly interested in her bookish B&B landlord, Caldwell, but then a pesky stylish Frenchwoman turns up who seems awfully chummy with him. Throw in lots of London sight-seeing, and poor Karen was kept exceedingly busy on her short trip. She even manages to work in a visit to the book mecca of Hay-on-Wye (although, another quibble, 3 people went in Caldwell's Smart car, so I can't imagine how that worked out). Still, this book is a fun blend of books and London, two of my favorite things, so I couldn't help but enjoy it. It's a nice escape where the bad guys get what's coming to them, and the good are rewarded. Can't ask for more than that!